Just about two weeks after the 2018 Duke Energy Carolina and Duke Energy Progress solar rebate opened for applications on July 9, 2018, the utility announced that the residential and commercial rebate segments are fully subscribed for the year. The only customer category where rebate capacity is still available in 2018 is for nonprofits. Qualified organizations, churches, or other non-profit entities can get help from a solar installation provider (see our Find a Contractor page) and look into how viable solar is for your group or place of worship, and your solar vendor can provide assistance navigating Duke Energy’s rebate reservation application process. If you’re a homeowner or represent a business that’s interested in going solar soon and trying for the rebate, there are still opportunities. 2018 is only the first year of a five year rebate program. At this time, there is no indication that the rebate amounts (50 cents per Watt for commercial solar and 60 cents per Watt for residential solar) would change next year, in other words you have a shot at the same amount of rebate value next year as you did this year. If your solar project isn’t started yet, look for an installer near you and learn how much solar can impact your utility bills and advance your goal to reduce your own reliance on the grid. 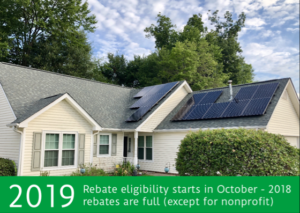 We understand that during the last 90 days of 2018, customers can begin their solar projects (this period will begin on or around October 3, 2018) and become eligible to apply for the rebate starting on January 1, 2019. Also be sure to ask your installer about the process to apply to reserve your rebate ahead of time, if you’re not interested in going solar with any less than the full rebate (which neither Duke Energy nor your solar installer can guarantee). Wait-listed or Encountering a Problem? Did you try applying this year and get wait-listed, or was there a problem with your application? Stay in touch with your solar installer, because Duke Energy is currently asking for state utilities commission approval to allow those customers to re-apply in 2019. By September 2019 there should be a response from regulators as to whether they’ll grant this exception to the solar rebate program guidelines to let some 2019 dollars potentially go to eligible 2018 applicants.